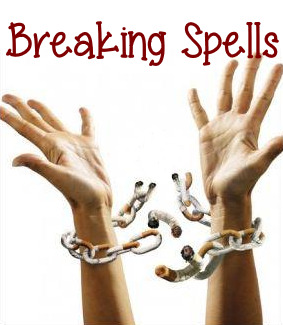 Breaking spells are intended to break a spell that has been cast against you. So if you feel that someone else is using witchcraft to cause you misfortune, these are the spells you want to try. Banishing spells may keep someone away from you, but they will not break any curse or hex already created. And please remember that not all bad luck is caused by someone else cursing you. Yes it can (and does) happen, but be reasonable when trying more magick just because a few things go wrong for you. You can be liberal with the herbs, as long as they are in roughly the same proportions. Perform this spell on the night after a full moon for the best results. On your altar (or right in the bathroom) make a circle with the 12 white candles. Put the black one in the middle. Don't light them just yet. Stay in the bath until the water begins to cool off. When you get out, snuff out the candles but leave them in their circle. For the next 3 nights, relight them all and repeat the second part of the chant. After the 3rd night, relight the black candle and let it burn all the way out (if it's not already finished). 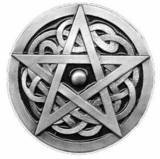 On your table, sprinkle a fine line of salt to draw a pentacle. It doesn't have to be perfect but try to get it somewhat symmetrical. At each point of the star, add a few drops of rosemary oil or a sprinkle of dry rosemary (yes, right on the table top). Then set 1 white candle at each point. This is the latest spell I've added to our Youtube channel. Check it out. Additionally, I have a new page on how to break a spell that has more spells you can try against any negative magick. If curse breaking spells aren't exactly what you are looking for, there are banishing spells or binding spells that might be more suitable for your situation.